In Odyssey’s kitchen, all the non-refrigerated food is stored in two pull-out drawers. Each drawer is 12” wide by 30” long by 5” deep, with another 4” of clearance above them so that a 9” tall box would fit upright. The drawers are behind swinging doors, so they look like a regular cabinet from the outside. In those two drawers we carry enough dry and canned food to last us two to four weeks, plus the storage containers we use to save leftovers. One of the ways that I maximize the available space in the drawers is to choose as many rectangular packages as possible. If I have the choice between pasta in a box vs. a bag, I choose the box. Some spaghetti sauces and olive oils come in glass jars that are square rather than round. Even better is to remove bulky packaging altogether and put the food into rectangular storage. I have four of these Snapware storage containers that I use for two kinds of bulk nuts, rice, and sugar. The 64 oz. ones hold a lot and fill the drawer space really well with no wasted space in between. Anything you use in bulk is a good candidate for storing like this; you’ll be surprised at how much more you can fit after you jiggle it down into the canister. How about cereal, cookies, flour, elbow macaroni, crackers? For leftover storage, I use Rubbermaid Stain Shield containers. Their new product is called Premier, but the idea is the same. The different volume containers are square and have the same “footprint” so they stack inside each other and can share the same lids. (They also make round containers but we are avoiding round things, remember?) We have the three each of the 3 cup and 5 cup sizes, which is plenty for the way we cook. All six of them stack in one pile with the lids on top and I could easily fit six more in the same pile with the 9” of vertical clearance. This cute little graphic shows how they nest in your cupboard: click on "Easy Store." 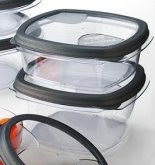 Rubbermaid is a fine product and available all over the place, but they have many equally good competitors: Tupperware, FreshVac, Stak N Store, even the disposable Glad and Ziploc ones. The important thing to maximize storage efficiency is to make sure they are square/rectangular and stack inside each other. This usually means picking one brand and sticking with it as they are all a little different. We had many perfectly good storage containers in our sticks and bricks home before we went full time. They had worked their way into our lives over a period of years. They were round, square, even triangular; margarine containers and yogurt cups and old Tupperware from by-gone apartment warming parties. All were tossed into a big drawer. Matching lids were tricky to find in that jumbled drawer. We had the luxury of space, so who cared? We got rid of all of it at a garage sale and started fresh with these new, efficient products. While your RV kitchen may have lots of more cupboard space than ours does, it is still smaller than most kitchens. No matter whether you have overhead cabinets, drawers, or a pull-out pantry, you can probably fit more in there if you use square or rectangular storage, especially if you measure your space first and take advantage of the height of each shelf or drawer.